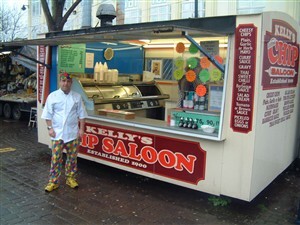 One of the most famous things in Yarmouth's market place has always been the quality of its fish and chips, shown here in the guise of Mr Steven Eastaul, in front of Kelly's Chip Stall, which he now runs, which has been on the market place for decades. Another long-running chip stall is Nicholls, the owner of which, Mr Frank Nicholls, also had a Fish Restaurant on the corner of the market, where the Market Gates Centre now stands. His daughter still runs the family stall today. I have reported on Nicholls Fish Resturant before, and the owner mentioned in this report is not correct, as I used to work there in the mid to late sixties early seventies and the owner's name was Percy Nicholls who used to live on Caister Road. He also had, as far as I can remember, three sons - Ivan, who was at the Market Place restaurant and St.Peter's Road, Lesley, who used to run the restaurant at South Beach Parade near the Pleasure Beach, and there was Stanley who ran a caravan park at Fleggburgh. I apologise if my information is incorrect, but my family and I have been friends with Frank Nicholls himself for many years, and we were under the impression that he, or his family, also ran the restaurant. I was introduced to 'raw' tripe and reed, when I got to Gt Yarmouth. My husband and I still remember the chips, tripe, mushy peas, cockles, whelks and mussels. We have lived in Australia since 1963. Our first born was born at Gt Yarmouth General Hospital. When I was a boy in the late fifties, I stayed at a boarding house in Euston Road that was run by Pam Nicholls. Was she related to this family? I always enjoyed our time spent there as you were always made to feel so welcome. Just to set the record straight . The man in the photo was my late husband Steven Extall . He sadly died at 46 years old on the 18th of august 2010 .